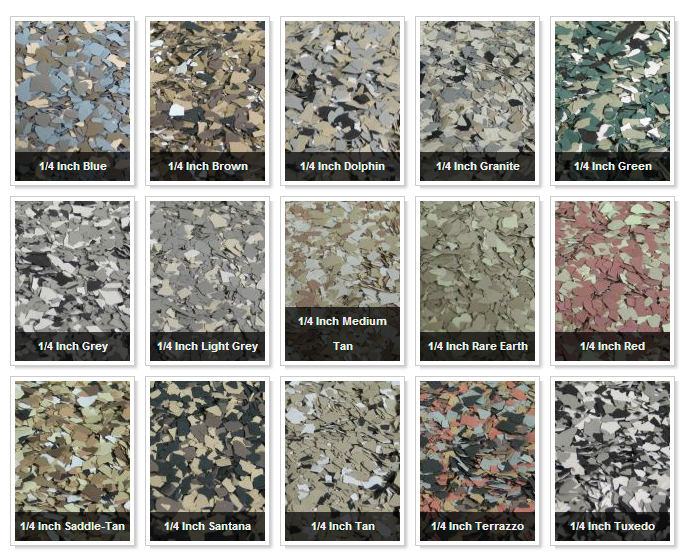 Garage Flooring The Roll On Rock flooring product will transform your dull and dreary concrete floor into a stunning, seamless, masterpiece that will outshine other comparable systems for years. When incorporating the Extreme Gloss Polyurea Topcoat in your finish, rest assured that you are getting the absolute best-looking, clear topcoat available in the country. The Polyurea topcoat has an incredible gloss while providing extreme chemical and abrasion resistance, which is why it will continue to shine when others start to fade. In 1999, Roll On Rock revolutionized the garage floor coating industry by introducing a 2 Step Flake System when all other systems were 4 or more steps. 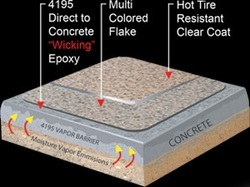 This was accomplished by creating a proprietary epoxy that wicks deep into the concrete, creating a bond that is 3 times stronger than ordinary epoxy or polyaspartic systems over concrete. In fact, this revolutionary system will withstand at least 8 lbs. of MVE (moisture vapor emission) pressure, while others fail at 3 lbs. Most garage concrete slabs in the Northwest emit water vapor at or around 3 or 4 lbs. of MVE pressure. I want to stress the fact that Roll on Rock seals the floor 3 times greater than ordinary epoxies and polyaspartic floor coatings. Garage floors fail when the base coat can't seal the rising water vapor. Do you want to roll the dice with an ordinary epoxy or polyaspartic or do you want to rest assured that Roll on Rock will seal your garage floor? Additionally, the clear topcoat will not yellow from sun exposure and most are under 10 VOC (volatile organic compounds), making it safer for the planet's ozone. And when we say the clear topcoat is Hot Tire Resistant, we mean it. It will not yellow, darken, stain or lift from hot tires. You can expect to easily wipe up any tire marks for years to come. When other products say they are Hot Tire Resistant, they mean it won't peel. With Roll on Rock, it's as if your car was never parked in the garage! New advances in the technology allows Roll On Rock to be installed in 1 day. An additive that can be mixed in decreases the base coat dry time to 3 hours. Now you can get the same 1 day install results of a polyaspartic, but with 3 times better adhesion to bare concrete. You are walking on the floor in 4-6 hours after the top coat has been applied. Heavy point load items (cars, refrigerator/freezer, workout equipment etc...) need to wait approximately 48 hours before being brought back into the garage as the floor needs to completely cure. On a day to day basis loose dirt, dust, and other debris can be removed by regular sweeping, mopping and/or vacuuming of the surface. All spills should be cleaned up immediately to prevent a chemical attack and staining in the topcoat sealer. General cleaning of stubborn surface debris can be accomplished using a mild, environmentally safe soap solution in accordance with the manufacturer’s instructions. Harsh detergents, acids, and alkali are not recommended as they can damage the surface. World class products, installation and service. We will come to you anywhere in the Seattle area to discuss your project. Lake Forest Park, Lake Stevens, Lynnwood, Maple Valley, Medina, Mercer Island, Mill Creek, Mountlake Terrace, Mukilteo, Newcastle, Normandy Park, North Bend, Pacific, Puyallup, Redmond, Renton, Sammamish, SeaTac, Seattle, Shoreline, Snohomish, Snoqualmie, Sumner, Tukwila, Woodinville and Woodway. ANY location is possible with a destination charge appropriate to the location. Website by MIM Marketing In Motion Inc.